I am very grateful for the opportunity to write about this subject. If only more Catholic publications were open to a search for the truth on what is, in the post-conciliar ambience, a—most "politically incorrect" subject: the Message of Fatima and its relation to the current crisis in the Church and the world. The subjects of this piece are: (1) The evident suppression of a text of the Third Secret of Fatima that would explain and accompany the vision of the "Bishop dressed in White" published under the auspices (strangely enough) of the Vatican Secretary of State on June 26, 2000. (2) The other subject is the obviously not done Consecration of Russia which Cardinal Bertone would forbid us from talking about. In my extended version of this article, I have appended a summary of the key facts [NOTE] that eliminate all reasonable doubt that, as Socci writes, "the explosive part of the 'Third Secret of Fatima' exists yet is well hidden ..." Indeed, Socci has helped make history by writing a book on the subject that essentially accuses the Vatican Secretary of State of suppressing the very words of the Mother of God. 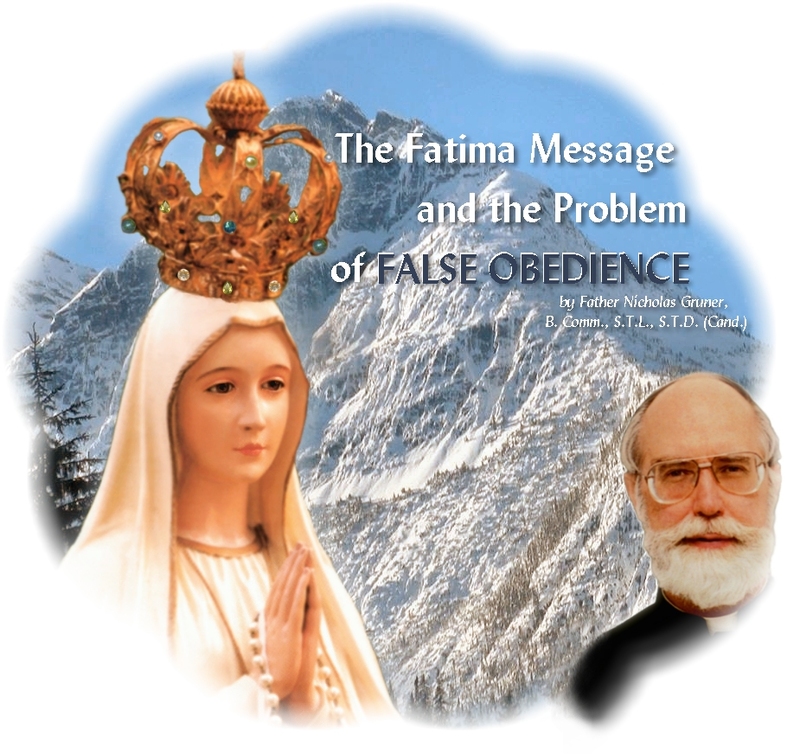 Rather than reviewing the evidence, my focus here will be on a great obstacle to accomplishment of the imperatives of the Fatima Message: false obedience. Permit me a brief sketch of the context in which this obstacle has arisen. damage in the Church. The very existence of a previously unheard-of distinction between Novus Ordo and "traditionalist" Catholics tells us that the "reforms" of Vatican II have caused a disastrous quasi-schism within the Church itself. though they were defined dogmas of the Faith, even though Pope Benedict has exposed the utter fraudulence of this posture by declaring that the ancient Mass was "never abrogated" and that its use by every priest in the Church was "always permitted." obedience of faith has widely been replaced in the post-conciliar epoch by obedience to their authority for its own sake. Positivism (my will is law) and nominalism (what I will is good because I will it) have invaded the Church, cloaking their abuses in the virtue ofobedience, which seems to have become the only virtue insisted upon by ecclesiastical authority. lamented—but too late, for the "opening to the world" had already begun to inflict its incalculable damage, and the "smoke of Satan" he also belatedly lamented had already entered the Church through the "fissures" he noticed only after the smoke had entered. but only various "social contracts" resting on "consent." All authority on earth, both temporal and spiritual—from the parent to the policeman to the politician, from the priest to the prelate to the Pope—is ultimately derived from Divine authority. All who exercise authority of whatsoever kind, even papal authority, must exercise that authority in conformity with the Divine will. And all who obey authority of whatsoever kind must obey Divine authority first. The failure to recognize and acknowledge the obedience which is absolutely due to God above all human authority is what is wrong with the modern notion of authority. It accounts for the moral, political, and social chaos of our time. And that same chaos, as Paul VI lamented too late, has infected even the human element of the Church, producing the paradoxical situation of demands to respect "authority" that contravenes the very basis of all true authority: the Divine will for man. where it does not contravene God’s law, is actually an act of justice—of giving to another, and ultimately to God, what is due. But God does not give any man the authority to command, nor anyone the right to obey a command, that contravenes the commands He has given us, including the Decalogue and the law of the Gospel, which is the "positive law" of Christ the King. ambit of his jurisdiction—supersedes the command of the lower authority. There is a hierarchy of Angels, a hierarchy of being in nature and a hierarchy of authority in the Church. Our Lady’s authority, after that of Her Divine Son, is the highest authority in the Church and the world. It must be noted that the Blessed Virgin Mary, as Queen of Heaven and Earth and Mother of all the living, has real maternal and royal authority over each one of us, every member of the human race, and particularly every Catholic, including each and every priest, bishop, and Cardinal, and finally the Pope himself. Church. The Message of Fatima, with its prescriptions for the Church, is precisely an exercise of Her authority over the entire Church, the Pope included. And it is impossible for the sinless and ever Virgin Mother of God, possessed of the Beatific Vision in a unique and unequalled way, to abuse or exceed Her authority. Therefore, when She commands, we must obey. Even the Pope must obey Her. Hence obedience to the Message of Fatima, which means obedience to the Mother of God, is subsumed under the concept of the obedience of faith binding even the Pope to act for the faith, for the salvation of souls, above all else. Which brings me to the question of the Third Secret in particular and its relation to the problem of false obedience. But the Vatican Secretary of State, Cardinal Bertone, continues to maintain the fiction that the "not easy to decipher"  the vision of the "Bishop dressed in White," which has received a welter of conflicting interpretations, is all there is to the Third Secret of Fatima. He steadfastly and most tellingly refused to inquire of Sister Lucia regarding the momentous "etc" even though he had every opportunity to do so over the five years of controversy that raged from the time the vision was published in 2000—to widespread skepticism about the completeness of the Vatican’s disclosure—until Sister Lucia’s deathin 2005. Or perhaps he did inquire and is in possession of information he has deemed expedient not to reveal. Now, however, the partisans of a false and blind obedience to authority counsel us to forget the very words of the Mother of God because a Vatican functionary has deemed them dispensable. One such spokesman, Antonio Borelli  of Tradition, Family and Property (TFP), who professes to be a champion of Our Lady of Fatima, declares that the words embraced by that telltale "etc" "will remain forever an inexplicable mystery" and that "It is a great disappointment that it has not been possible to resolve the question of the 'etc,' but we have to work with that concrete unavoidable fact." Really? And why isthat? matter, as the Vatican Secretariat of State is a creation of men not God, and is in no way part of the Divine constitution of the Church. Indeed, Pius XII dispensed with the office during his pontificate. troublesome "etc." But the partisans of false obedience argue that we must put the matter out of our minds to suit the wishes of Cardinal Bertone and all those who have no authority to conceal any part of the Message of Fatima. In like manner do they advocate blind and false obedience to human authority by commanding or appearing to command us to cease petitioning the Pope  for the Consecration of Russia to the Immaculate Heart, which Our Lady of Fatima prescribed for peace in the world and the salvation of souls in our time. They do so simply because human authority has declared a substitution for what the Queen of Heaven requested. Based on a "consecration of Russia" that refused to mention Russia, human authority—not the Pope, but a Vatican functionary, then Archbishop Bertone—declared in conjunction with publication of the vision in 2000 that "all further discussion or request" for the Consecration of Russia "is without basis." All further discussion or request! We are told by a man in the Vatican, who has no real authority in the matter, to refrain even from discussing what the Virgin Mother of God, speaking also as Mother of the Church, instructed the Church to do for salvation of souls and peace in the world. We must be quiet! Vatican Council, to seek a fully binding and authoritative ruling from the Pope on the matter. In response to the justified murmuring of the faithful, who would not be "quiet," on October 8, 2000 the Vatican bureaucracy offered another human substitute for what the Mother of God requested: a papal "entrustment" to Mary of practically everyone and everything on the face of the earth except Russia. This idea of an "entrustment," as opposed to the consecration Our Lady requested, was an "amendment" of Heaven’s prescription to suit the objection of certain human authorities to a consecration of anything to the Immaculate Heart, which they consider theologically untenable. This disdain for the Consecration of Russia to the Immaculate Heart of Mary reflects a disdain for the Fatima event in general by those who pursue the "new orientation" of the Church, and a wish to be done with Fatima once and for all—while, of course, giving the appearance of treating it seriously so as to appease the "simple faithful," as they like to call them. On May 13, 2010 at Fatima, the Pope prayed that the Triumph of the Immaculate Heart of Mary be realized before 2017 A.D. Thus, Pope Benedict XVI himself rejects the absurd contention of human "authority" (such as Cardinal Bertone) that the 1984 ceremony was the "Consecration of Russia"  Our Lady has requested and that what we see in Russia today—a neo-Stalinist dictatorship and three abortions for every woman—and that what we see in the world today—moral, spiritual, social, political and economic collapse—is the Triumph of the Immaculate Heart that She promised upon Russia’s consecration to Her. That the Message of Fatima is from God is the reason that, as one Catholic writer so aptly put it, Fatima keeps bobbing to the surface like a cork underwater. What certain men, who exceed their authority, keep trying to submerge—Fatima—rises again and again, with the Pope himself frustrating their effort to keep it down. "I say to you, that if these shall hold their peace, the stones will cry out." (Luke 19:40) Thus did Our Lord reply to the Pharisees when they demanded that He silence His disciples, who were proclaiming: "Blessed be the king who cometh in the name of the Lord". The Pharisees who would soon orchestrate the execution of the very Anointed One for Whom they and the Jewish race had been waiting, first attempted an expedient compromise: obey us, your religious superiors. Remain silent, as we demand, and we will leave you alone. And when He drew near, seeing the city, He wept over it, saying: If thou also hadst known, and that in this thy day, the things that are to thy peace; but now they are hidden from thy eyes. For the days shall come upon thee, and thy enemies shall cast a trench about thee, and compass thee round, and straiten thee on every side, And beat thee flat to the ground, and thy children who are in thee: and they shall not leave in thee a stone upon a stone: because thou hast not known the time of thy visitation. And so it is with the Message of Fatima, which contains "things that are to thy peace; but now they are hidden from thy eyes"—that is, from the eyes of the very people who have a duty to heed them and make them known, just as the Pharisees who demanded silence from the disciples had a duty to heed and follow the Messiah. including the Communion of Reparation, making sacrifices for sinners, and the fervent recitation of the Rosary. And what greater prophetic credentials could there be than those of the very Mother of God and the Miracle of the Sun—the greatest public miracle since the Resurrection—which She deigned to obtain in response to Her mocking challengers so that "all might see and believe." We must do what the disciples did when confronted by a demand for false and immoral obedience: respectfully, but firmly, refuse to obey. As Saint Thomas teaches, we have the right and even the duty to disobey certain commands of the Church’s rulers for the same reasons we are not bound to obey political rulers in all things. Firstly, "Charity," says St. Thomas, "is a greater virtue than obedience." The greatest charity is the salvation of souls. Our Lady said, "If what I say to you is done, many souls will be saved and there will be peace." (July 13, 1917) And, as the Church teaches and professes, the salvation of souls is her first law. (Canon 1752) Hence, the Message of Fatima pertains to the first law of the Church—the law to which all other laws of the Church must be conformed. Secondly, it is a matter of common sense—and no one has more common sense than St. Thomas—that not even the rulers of the Church have any authority from God to exceed the scope of their authority, as the Secretary of State has done in the case of Fatima. Nor can any authority in the Church demand obedience to unjust commands contrary to the common good of the Church or the divine law itself, or to even a mere human good where undue harm would result. For example, if even the Pope were to issue a command that all Catholics must sleep on the floor for the rest of their lives as a penance, one could refuse to obey such a command merely on account of its undue burden on the human good and necessity of sleep. indiscreet obedience, which obeys even in matters unlawful. Indiscreet obedience is contrary to God’s law and, therefore, we must never give it. Indiscreet obedience is, quite simply, a sin. superior only in respect of those things that belong to his mode of religious life—that limited obedience suffices unto salvation. If a subject wishes to obey in other matters, he would be exhibiting a superabundance of the virtue of obedience. But such superabundant obedience must not be "contrary to God or to the rule they profess, for obedience in these cases would be unlawful." I repeat: St. Thomas teaches that it would be unlawful for even a professed religious, under the strictest vow of obedience, to obey a command contrary to God or to the rule that he professes before God. To obey a command to be silent from those who despise the prophecy of the Mother of God at Fatima is to despise that prophecy oneself, contrary to the injunction of the Gospel, and thus contrary to God. It is also contrary to the rule that all Catholics profess at Baptism and Confirmation: the rule of Faith, which obliges one not to despise prophecy, and to refuse to follow those who do despise prophecy. To follow the despisers of prophecy is, in fact, disobedience of the worst sortthe following of men rather than God, which will lead to our destruction no less surely than it did the destruction of Jerusalem. As Our Lady of Fatima Herself warns us: "If My requests are heeded, Russia will be converted, and there will be peace; if not, she will spread her errors throughout the world, causing wars and persecutions of the Church. The good will be martyred, the Holy Father will have much to suffer, various nations will be annihilated." "obedience," but a sin of omission. Our duty, therefore, is not to obey those who would be done with Fatima, but on the contrary unceasingly to pray, petition, and demand with all due respect that human will give way to the Divine will, that the Third Secret of Fatimaa precious message-warning to the Church and the whole worldbe revealed in full, and that Russia be consecrated to the Immaculate Heart of Mary. But here we need only consider the example of the King of France. If the King of France had not been subject to obedience to the Sacred Heart of Jesus when he was given the order through St. Margaret Mary, on June 17, 1689, to consecrate France to the Sacred Heart, then there would have been no justification for the chastisement of his successor, Louis XVI, on June 17, 1789—one hundred years to the day later—when the Third Estate overthrew his authority and declared itself the National Assembly, thus commencing the French Revolution that led to Louis’ execution in 1793.
chastisement of the Pope and the bishops as foretold in the vision of the "Bishop dressed in White"—being executed by a band of soldiers outside a half-ruined city—would not be justified on account of their failure to consecrate Russia or to reveal the Third Secret in its entirety. Yet, it is precisely a lack of obedience by the King, in the first case, and by the Pope and bishops, in the second, that calls down a Divine chastisement upon their heads. execution of My command, they will also follow him into misfortune." If the Pope wishes to follow fallible advisors instead of the Mother of God, then, like the King of France, he will be required to pay the price. Similarly, if the bishops, by their indolence, rebellion or false counsel, persist in impeding fulfillment of the imperatives for the Church laid down at Fatima, they will find themselves on that hillside outside the ruined city in the vision, alongside the "Bishop dressed in White," who is executed before they are executed. And may God have mercy on us all! For if we neglect to do the part allotted to each of us according to his station in the Church, then we will share in the punishment due for not recognizing our moment of grace and pardon and the moment of our "visitation" [Luke 19:43], which is fast expiring. Like the Gospelindeed, because of the Gospelthe Message of Fatima must be shouted from the rooftops. Not the stones in the ground, but Catholics all over the world must proclaim the Message of Fatima until its Divine imperatives have been heard and obeyed by the wayward leaders of a Church they have led into an unprecedented crisis. Only then can the Church and the world avoid the fate of which we have been well warned by the greatest of all the Prophets after Our Lord Himself: His sinless Mother, Mediatrix of all graces, including the grace of Fatima. Marie, O.C.D., "REFLECTIONS on the Act of Consecration at Fatima of Pope John Paul II on 13th May 1982", in Marianum (Rome: Ephemerides Mariologiae, 1982), Annus XLIV, Fasc. I-II, No. 128, pp. 88-142. See also Father Joseph de Sainte-Marie, O.C.D., "The Church’s Duty in the Face of the Fatima Message", in The Fatima Crusader, No. 9. See "The Fatima Message and the Problem of False Obedience" in Fatima Exclusives on www.fatima.org for the full article with the summary of the key facts. 1. Antonio Socci, Il Quarto Segreto di Fatima [The Fourth Secret of Fatima] (Milano: Rizzoli, 2006), English ed., p. 162; popular ed., p. 111; Italian ed., pp. 172-173.
and http://www.fatimapriest.com/bIIch6.html. See also Father Joseph de Sainte-Marie, O.C.D., "REFLECTIONS on the Act of Consecration at Fatima of Pope John Paul II on 13th May 1982", in World Enslavement or Peace ... It’s Up to the Pope (Fort Erie: The Fatima Crusader, 1988), Section XV, pp. 534-582; originally published in Marianum (Rome: Ephemerides Mariologiae, 1982), Annus XLIV, Fasc. I-II, No. 128, pp. 88-142. 4. Frère Michel de la Sainte Trinité, The Whole Truth About Fatima - Vol. III: The Third Secret (Buffalo: Immaculate Heart Publications, 1990, republished in 2001), p. 710. 5. As Cardinal Ratzinger called it in The Message of Fatima, p. 32. 7. Mgr. Georges Roche, Pie XII Devant L’Histoire (Paris: Editions Robert Laffont, 1972), p. 52. Dz. 466 (D.S. 861), Dz. 1830 (D.S. 3063) and Dz. 1831 (D.S. 3064). 10. See Inside the Vatican magazine, November 2000. 11. L’Osservatore Romano, May 19, 1982. 12. "Introduction", The Message of Fatima (2000), www.vatican.va/roman_curia/congregations/cfaith/documents/rc_con_cfaith_doc_20000626_message-fatima_en.html. 14. On March 25, 1984, Pope John Paul II also rejected this absurd contention by stating after the consecration, "Enlighten especially the peoples of which You Yourself are awaiting our consecration and confiding", as reported in the March 26-27, 1984 issue of L’Osservatore Romano. See photographic reproduction in Father Paul Kramer, The Devil’s Final Battle, Second Edition (Buffalo: The Missionary Association, 2010), Appendix I; cf. The Devil’s Final Battle, First Edition (2002), p. 274. See also photographic reproduction of the L’Osservatore Romano article reporting similar words spoken by the Pope in a public prayer three hours later, in The Devil’s Final Battle, Second Edition, one-volume version, photo insert section, p. XVI; two-volume version, p. 287. 16. Summa Theologicae, II-II, Q. 174, Art. 6. 17. For a further detailed explanation (beyond this article) of why the Church is bound to obey Our Lady of Fatima, see my various essays on this subject, including: "The Message of Fatima Imposes an Obligation on the Church" (http://www.worldenslavementorpeace.com/e5cp2.asp), "The Bishops Must Obey Our Lady of Fatima" (http://www.worldenslavementorpeace.com/e5cp3.asp) and "World Peace Depends on the Catholic Bishops and You" (http://www.worldenslavementorpeace.com/e5cp5.asp) in World Enslavement or Peace ... It’s Up to the Pope, pp. 84-111, 117-134. 18. Antonio Socci, Il Quarto Segreto di Fatima [The Fourth Secret of Fatima] (Milano: Rizzoli, 2006), English ed., pp. 7-9; popular ed., pp. 13-14; Italian ed., p. 17. See also Father Nicholas Gruner and other Fatima experts, "The Church (That is the Faithful, the Bishops, the Pope) Have the Obligation to Obey Our Lady’s Requests", World Enslavement or Peace ... It’s Up to the Pope, Section V, pp. 83-157. 21. Summa Theologicae, II-II, Q. 104, Art. 3. 22. English translation of text in Sister Lucia, "Fourth Memoir", Fatima in Lucia’s Own Words (Fatima: Postulation Centre, 1976), p. 162. See also Frère Michel de la Sainte Trinité, The Whole Truth About Fatima - Vol. I: Science and the Facts (Buffalo: Immaculate Heart Publications, 1989), p. 182. 23. Summa Theologicae, II-II, Q. 104, Art. 5. 24. Cf. World Enslavement or Peace ... It’s Up to the Pope and other essays referred to in these footnotes.